Odds are, you are fed up with dragging a garden hose around to water your yard. The last thing you want to do after you get off work is yardwork. You wish you had a water sprinkler Champaign IL neighbors have, but you are worried about the cost. 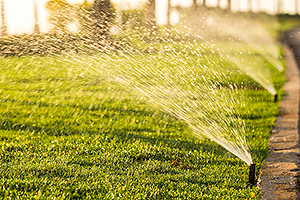 Rather than spend more time envying your neighbor’s water sprinkler system, why not call Commercial Irrigation & Turf? Trust our 30 years of experience to show you the value of the water sprinkler Champaign IL homeowners prefer. To that end, call us today at 217-398-1494 or contact us online to request more information. Why Buy a Water Sprinkler Champaign IL Residents Like? Automation – You can provide a timed, even distribution of water to your yard that turns on and off on its own. Think of how many times you have been distracted while watering your yard. As a result, you oversaturated one area and then skimped on another because you got tired. Conservation – Since your whole yard will get the water it needs from your professionally-designed system, you save water. On the other hand, you could keep using your hose attachment to overwater a part of your yard while others stay dry. Cost Savings – You will save money on your water bill. When you are in a rush, it is easy to forget to turn off a hose attachment or the water supply. Consequently, you get home to find parts of the yard, sidewalk and driveway are flooded. With an automated system, you can stop paying to water concrete and paved surfaces. Convenience – Think of all the times you have had to alter your plans so that someone could be home to shut off the hose attachment. For that matter, think of all the time you have spent bored and frustrated watering with your hose. In order to get back to having more fun, just get a Commercial Irrigation & Turf water sprinkler system. Every day for more than 30 years, Commercial Irrigation has delivered value to clients. 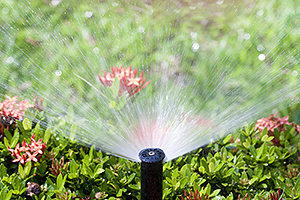 We design, install and repair custom irrigation systems for both residential and commercial customers. For that reason, we are the irrigation contractors you can trust with your lawn. In order to get started with your yard sprinklers, call us today at 217-398-1494 or contact us online to request more information. Also, you can find us at 206 N Randolph Street in Champaign. Not in Champaign? No problem. We also serve customers in Peoria, Bloomington, Galesburg, Pekin, Springfield and surrounding areas.